Dr. Asim Hussain, SI, HI is active in the field of health and education, and Pakistani politics as well. He is chairman of Ziauddin Group of Hospitals in Karachi, and former Advisor of Prime Minister for Ministry of Oil and Natural Resources, Pakistan. He currently serves as the Chairman of Higher Commission of Pakistan, Sindh and Chairman of Petroleum Institute of Pakistan. 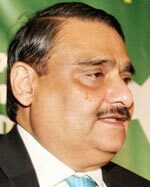 Dr. Asim Hussain belongs to the influential family of Sir Dr. Ziauddin Ahmed, who was one of the key political figures at the time of Independence of Pakistan and a close ally of Sir Syed Ahmad Khan. In recognition of his services to the nation in the fields of education and health care he has been conferred with the Sitara-e-Imtiaaz and Hilaal-e-Imtiaaz. Hussain was born in Karachi, Pakistan on 28 November 1953. He is the grandson of Sir Dr.Ziauddin Ahmed, who was a famous mathematician, the longest serving Vice Chancellor of Aligarh Muslim University , and a key educationist prior to independence of Pakistan. Hussain was born to Ms. Ejaz Fatima and Mr. Tajammul Hussain, the founding members of the Dr. Ziauddin Group of Hospitals. Dr. Asim Hussain received his early education from the Karachi Grammar School and later enrolled in the Cadet College, Petaro. After serving a brief period in the Army, Dr. Asim Hussain retired as a Lieutenant and chose to pursue the degree of MBBS. He graduated from Dow Medical College (now, Dow University of Health Sciences) Karachi in 1978 and went to Europe for further studies. He successfully cleared M.C.P.S in 1981 and continued his studies in Vienne, Austria. After returning to Pakistan, he entered in politics. Chairman, Board of Governor, Ziauddin Medical University.